The revival of the traditional livestock protection method shows that free-ranging guard dogs accompanying flocks are an effective tool to prevent wolf and bear attacks. The tradition of using livestock-guarding dogs was abandoned in Slovakia in the mid-20th century, when large carnivores had become rare. From that time onwards, there was no need to keep dogs free. Guard dogs are kept at farms, permanently chained close to the flock of sheep or farm buildings. This has the advantage of alerting shepherds or dissuading less determined predators but cannot repel wolf or bear attacks. One of the reasons why they are chained is for human safety, but this is at the expense of livestock safety. 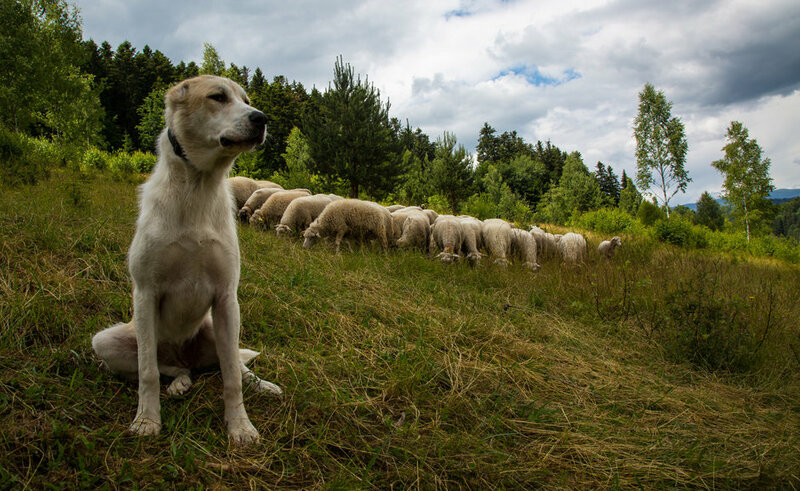 An experiment based on historical practice, realized in Central Slovakia, confirmed that free-ranging guard dogs accompanying flocks are very effective in livestock protection, but appropriate care for pups and suitable training of pups is necessary. Mr. Slavomír Finďo is a researcher, who all of his professional and private life consecrated to the study of the Carpathian wildlife with everything which it is connected. Big part of it was also the traditional shepherd lifestyle and carnivore conflicts directly linked on it. As he spent many time next to this specific community, he identify the biggest conflict connected with an inappropriate way of guarding dog keeping and breeding, what was reflected on high depredation on livestock. Therefore he and his team started to initiate the projects focused on bringing back the traditional style of keeping guardian dogs - free released. This experiment proves that livestock-guarding dogs can significantly influence (reduction more than 70%) losses of livestock. Number of large carnivores increased during the last year in Slovakia. Occurrence of these species is overlapping with sheep farming and predation on livestock is commonplace. Sheep are usually grazed in unfenced pastures attended by a shepherd and herding dog; one to five shepherdsspend the night nearby in a caravan, cabin or farm building. The tradition of using livestock-guarding dogs was abandoned in Slovakia in the mid 20-th century, when large carnivores had become rare. Large sheepdogs are still kept at 90% of farms but most of them are permanently chained near the sheepfold or farm buildings. They may confer a benefit in alerting shepherds or dissuading less determined predators but cannot repel wolf or bear attack. Dogs on chains are not so self confident when the danger is near as they are free and can form in to a guarding pack. The Project supplied farmers, free of charge, with pups of three different breeds: Slovenský čuvač, Caucasian shepherd dog and Central asian sheper dog. Pups were bought from dog breeders or stockmen, dewormed, vaccinated against distemper, parvovirus and rabies, and placed at working farms opting into the project. In most cases high quality commercial dog food was provided. Age at first contact with sheep was 5–13 weeks depending on availability of suitable pups and farms. Participating stockmen were asked to keep them in specially constructed enclosures, or barns, with >=5 young sheep that were to be regularly exchanged for different individuals throughout the socialization period, minimizing pup´s interactions with other dogs and humans. Subsequently, shepherds were encouraged to take young dogs out to pasture until eventually they could accompany flocks day and night. The presence of livestock-guarding dogs was associated with lower levels of predation and an absence of surplus killing. When the dogs spent much time outside, they were less aggressive than the chain dogs, and it was easier to adapt them to human present (random public visit). Bears were reintroduced thanks to Life Ursus project, but the wolf population expanded naturally and fastly Research was more implemented and developed than habitat quality and connectivity conservation This was a non-binding measure implemented by Autonomous Province of Trento, Adamello Brenta National Park in the frame of Life WolfAlps, Life Arctos, Life Dinalp Bear, Life Ursus in a province in the Autonomous Province of Trento. It specifically involved General public, Administrative staff (government). It operated for 18 years (from 1999 to 2017) and received financial support from EU funds, Other sources.Please reply to this post for more information or reach out directly to Umberto Fattori. In Friuli there isn't a stable wolf or bear population but the presence of young males in dispersion is constant This was a non-binding measure implemented by Friuli-Venezia Giulia region in the frame of Life WolfAlps, Life Arctos, Life Dinalp Bear in Italian Alps in the Friuli-Venezia Giulia region. It specifically involved General public, Administrative staff (government). It operated for 7 years (from 2010 to 2017) and received financial support from EU funds.Please reply to this post for more information or reach out directly to Elisabetta Rossi. In Lombardia there isn't a stable wolf or bear population but the presence of young males in dispersion is constant. Research consist primarily of occasional monitoring, while the theme of habitat quality and conservation hasn't been addressed yet, because it's not a priority. This was a non-binding measure implemented by Lombardia region in the frame of Life WolfAlps, Life Arctos, Life Gestire 2020 in Italian Alps in the Lombardia region. It specifically involved General public, Administrative staff (government). It operated for 7 years (from 2010 to 2017) and received financial support from EU funds.Please reply to this post for more information or reach out directly to Chiara Crotti. • Protection of Livestock and Conservation of Large Carnivores Project funded principally by the Born Free Foundation, The BEARS Project supported by WWF Denmark c/o the Danube-Carpathian Programme Office, and the Slovakia Wolf Census Project funded by the Wolves and Humans Foundation.